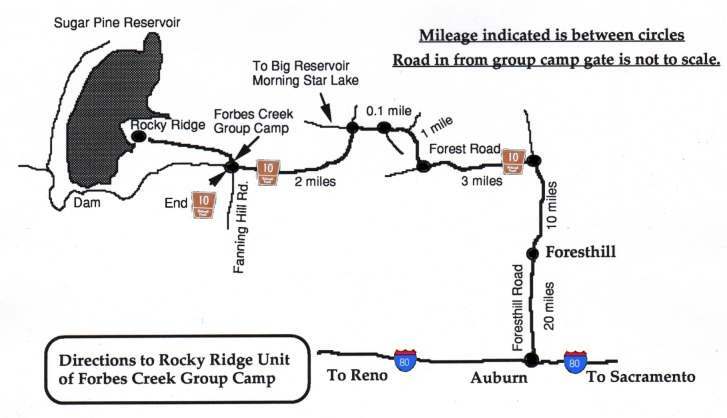 ​" A 2017 Camping Adventure"
The joint SFARC-MDARC campout will take place starting on Friday, June 2nd and end on Sunday, June 4th at the Sugar Pine Dam Recreation Area in the Forbes Creek section at the Rocky Ridge group site. It is one of the most beautiful spots in Placer County. This will be a joint venture between the Club and a another group of radio amateurs who have meeting for this annual event for over 40 years. We are limited to 50 people at this site so get your reservations in early. At approximately 3,000 feet above sea level, the campground has water and restroom facilities, no hookups, but nice spaces for trailers, tents and motor homes. There are three large barbecue pits available at our site as well as a large recessed pit for a grand campfire. There are plenty of trees as well as open space for stringing a G5RV and a double extended zepp for your HF station if it is your desire to bring one. However there are plans for at least one active HF station from WA6UHA (weather permitting). We will be using the club call, W6PW. Tentatively our stations will be active on 40 and 75 meters, during the day on the Noon Time Net frequency of 7268.5 khz (Friday afternoon and all day Saturday) and at night (Friday & Saturday) on 3952 khz (the Western Public Service Net frequency). It's time to pack up and enjoy the great outdoors and warm up for Field Day coming three weeks later. VHF and UHF paths for both Bay Area and Sacramento television and FM stations are quite good even with simple antennas. Obviously, working 2 meters and 440 into Sacramento and the Bay Area repeaters is not difficult especially during the early morning hours when path conditions are ideal. 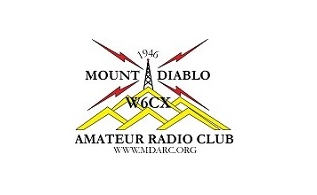 Call-in will be on the Mount Diablo W6CX 2 meter system 147.06+600 PL 100. Alternate system: 146.745 -600 W6SAR Foresthill PL 156.7.The Sugar Pine Lake is just a 1/2 mile from the campsite. A hiking trail leads to the water and connects to another trail that follows the perimeter of the lake. The main swimming area is located on the opposite side of the lake and is accessible by hiking or by a 10 minute drive. Between 12 noon and 1 PM, the forest ranger will arrive to unlock the gate for access to our site. The gate will remain open through out our stay. Also during this time and throughout the afternoon and the early evening the 145.43 repeater (PL 162.2hz), as well as the 146.745 -600 W6SAR Foresthill PL 156.7 will be monitored. If you are a a distance away from the campsite, the Mt. Diablo W6CX repeater (147.06 +600 100hz PL) will be available. When you arrive, park at any of the available spaces. There are plenty. That evening, you are on your own for dinner. Use your Weber or the barbecue pits provided at the site. A campfire and star party with telescopes will take place after dark. In the morning, you are on your own for breakfast after which, if you desire, join us for a hike to and around the lake. Weather pending, the view will be picture postcard as we make our way around. We will pass the swimming area and cross the dam as we make our way back to Rocky Ridge. The hike should take approximately 2 hours. After arriving back at the campsite, you are on your own for lunch if you desire but most of us would probably settle for a tall cold one. Later on you can scrounge around for wood for the campfire that night. Around 4:30 the full socializing begins and the bar is open. Bring out the appetizers and munches which is part of the pot luck. Also during this time, the host supplied charcoal will be prepared and the barbecue pits will be lit. However, before dinner as an idea conceived by Fred Townsend AE6QL, we will have a champagne cork popping contest. To participate in this event, bring your own champagne ...AND NO BOTTLES WITH SCREW-ON CAPS...CORK ONLY. As for dinner that follows, the hot coals will be provided for cooking your choice of meat. Please bring out a side dish, salad, rolls for dinner and dessert to share, and don't forget there will be great music for everyone's taste provided by Dave, WA6UHA. After dinner, the camp fire will be started so bring your own marshmallows. The sticks will be provided by the campsite. Enjoy the fire as we sing, chat, or whatever you would like to do at this time. Plus we will have a real space odyssey star party with a few astronomical telescopes set up. At approximately 8 am, preparation will be underway for the host provided barbecued pancakes. Two kinds will be provided, plain and Oregon Blueberry. After many years of research we were able to come up with a process that prevents the pancake batter from seeping through the grill and on to the charcoal. Supply your own beverages and sides and share if you like. ​In the late morning, it's cleanup time and we say our good-byes until next year. Click HERE for current conditions, plus short and long term forecasts. Looks Great...Now How Do We Get There?? From San Francisco, drive east on Interstate 80 through Auburn and exit at Foresthill. Head east on Foresthill Road crossing the mile long panoramic American River Bridge. Continue heading east for about 20 miles and you will reach the town of Foresthill. After passing through town continue east for another 10 miles and turn left at Sugar Pine Dam Road. There should be sign just before you reach the junction. Once you are on Sugar Pine Dam Road (Route 10), follow the road carefully, there are a few turnoffs that can possibly throw you off course. If you have any questions while on Foresthill or Sugar Pine Dam road, you should be in simplex range. Monitor 146.49. The 145.43 (PL 162.2) Auburn repeater should also be available and it will be the primary talk-in to get you to the site. In any case, stay on the blacktop. Eventually you approach a junction with the main road going slightly to the left and a road going slightly to the right with a gate which should be open for us. This is also the junction where route 10 ends as indicated by a sign even though the road continues. As you go past the gate, there is a sign posted there marking the reserved group campsites. Follow the signs for the Rocky Ridge site which will be reserved for us. The total drive time from San Francisco to the campground should be approximately 3 hours if you avoid the Bay Area and Sacramento rush hours. Just click DAVE WA6UHA and leave your name, home QTH, type of vehicle, and number in your party.